- Spices: salt, pepper, chili pepper, thyme, and bay leaves. - Dice the onions, and fry in oil on medium heat until they start falling apart (about 1 hour). We need them cooked thoroughly - they'll form a yummy sauce for the dish. 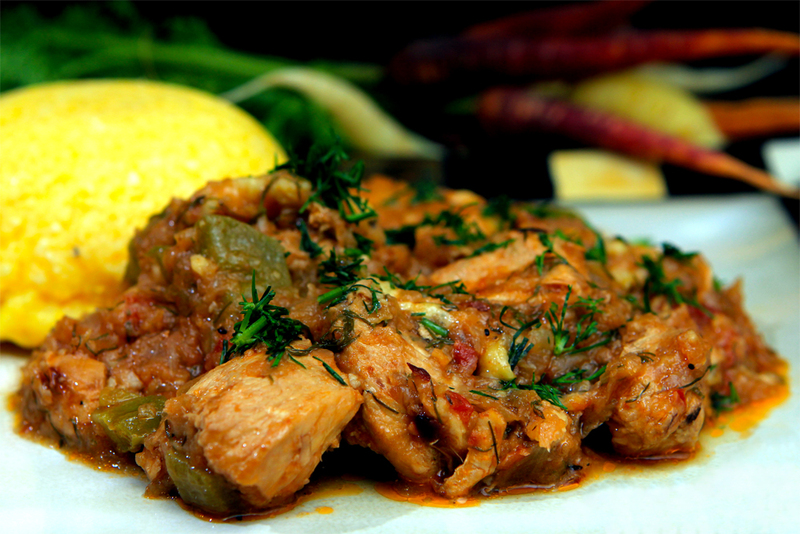 - Cut the chicken into cubes, and add to the recipe. Turn the heat to high, and cook for about 10 minutes. - Add salt, pepper, chili pepper, thyme, and 2-3 bay leaves. I like to exaggerate a bit with the chili, and make the dish spicy (which compliments well the sweetness of the cooked tomatoes). - Chop the bell pepper half and the tomato, and add to the dish. - Also, add a couple of cups of water. Reduce the heat to medium, and cook for another 20-30 minutes. - Remove from heat, and add one cup of chopped dill or parsley. - The set of colors in the dish can be further extended with strong greens and yellows. First, top the dish with a bit of fresh chopped dill or parsley just before presenting the dish to the guests. Then, serve the "tocanita" next to polenta: it adds a nice yellow to the presentation, while also the taste. - It you aimed for a spicy dish, a glass of cold beer goes really well alongside. Try to substitute chicken breast with chicken gizzard. Great flavor.